Immerse yourself in the Starfinder Society Roleplaying Guild! Each monthly adventure scenario follows the science-fantasy adventures of Starfinder Society agents as they traverse the expansive galaxy. Explore new planets, encounter exotic aliens, and make a lasting impact on the massive setting in Starfinder's world-wide "massively, multiplayer offline" campaign. Or simply build up your Starfinder adventure collection with monthly, high-impact single-session scenarios! Play is organized into Seasons, throughout which the actions and achievements of you and your fellow Starfinders create an ongoing storyline. Each season consists of numerous scenarios set in a variety of exotic locations to be found in the Starfinder universe. While designed for play in the Starfinder Society Roleplaying Guild, scenarios can easily be adapted for use with any world. A 20% discount off the price of each Pathfinder Society Roleplaying Guild scenario released as part of your subscription! Starfinder Society Roleplaying Guild Scenario Ongoing Subscriptions are now available! I'm confused about the Superscriber thing, if we subscribe to the other four do we get this one automatically, or do we need to subscribe to this and then it's free? If I manually subscribe to all five am I paying for this subscription and also receiving a second free copy of it, or is that exactly what I'm supposed to do? From my reading it seems like if you subscribe to the four Starfinder physical product lines you will be classified as a Starfinder 'superscriber', get a 15% discount, and receive the PDF subscription for the Starfinder Society scenarios free. 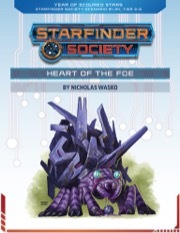 It seems unlikely that separately subscribing to the Starfinder Society scenarios would then result in two copies of the PDF, but I'd suggest just avoiding the issue by not subscribing to that one if you plan to do the other four. And see, that makes perfect sense and is exactly what I would assume...nevertheless it could just as easily not send anything, by saying that you're not subscribed to the Society subscription. From where I sit there are four possibilities. A) You subscribe to the four physical subs and nothing else, and receive free Society content because you're a Superscriber. B) You subscribe to the four physical subs and nothing else, and you receive nothing else because while you are eligible for the free content, you neglected to activate it. C) You subscribe to the four physical subs and also the Society sub, and simply aren't charged for your Society sub because you're a Superscriber. D) You subscribe to the four physical subs and also the Society sub, and get charged for the Society sub because you were automatically enrolled in the free version, and the second sub is now being paid for. Based on the information we've been given (that I can find) all four of these possibilities are equally possible. I know I've seen a couple other people asking the same question; I'd just appreciate a bit of official clarification if at all possible. See this post for more details. It looks like it is officially case A. Any information/plan on release of the Quests/Quest Pack? Yup, that's pretty specific. Awesome, thank you for the link. Much appreciated! Youppi! It's my first subscription for a Paizo product line. Shipping and importtax and the additional administrative costs simply prevent me from subscribing to anything bigger than softcovers, it's cheaper to buy hardcovers here and then buy the pdf if I still want that. They took out an authorization to charge for this today!!! Can't wait to read and run SFS! Still a couple of weeks away, unfortunately. That authorization will expire shortly. I am subscribed to the other 4 Starfinder subs. My books have shipped and my PDFs are available for download. I don't see any mention of this anywhere in my account so I want to confirm. 1. Will I eventually get these PDFs going forward without additional cost? 2. If so, will it include #1-01, #1-02, and #1-03 as well? Yes. They aren't releasing until August 17th. They should be in your downloads then (although being month one, it wouldn't be entirely surprising if the process takes a day or two. Excellent. Thank you for confirming! So curious I have seen mention of 5 different Society adventures one of which is 1-00 if memory serves correctly. Are all of those included in the Society subscription? 1-00 is created especially for Gen-Con and is a "special". I'm no expert, but i believe those are not in the subscription. As far as I'm aware, the Organized Play team has not stated that #01-00 was created especially for Gen Con. It debuts at Gen Con, but it otherwise intended as an introductory pregen special for all gaming venues. My understanding is that #01-00 and the Quest pack will not be included in the subscription. ah interesting so my question then becomes.. just how, as the rabid collector that i am, do I get a hold of these? is it at all possible? Starfinder Guild Quest: Into the Unknown consisting of five one-hour scenarios coming up, which doesn't have a price attached (yet). I changed my two posts above, after checking again. You should be able to download the two pdfs mentioned above on the 17th. PDFs are a bit of a blindspot for me. However, I think that Paizo don't have preorder options for them, as a general rule. We do not offer preorders for PDFs beyond those contained in the Pathfinder Society and Starfinder Society Rolelpaying Guild Scenario Subscriptions. #1-00 will be available for purchase on August 17th. The above mentioned pdf is gonna be downloadable on august 17th FOR FREE!!! How awesome is the Paizo crew? I think this is the perfect way to show the game to new players. Together with the pregenerated iconic character sheets (available soon), people who have never played before can do so. Now we only need basic "quick-start rules" and everyone can start playing Starfinder and get hooked! I plan on showing this scenario to lot's of people. Indeed! that is exactly what I was thinking. Old to pathfinder but never ran any organized play events. Figured I would give it a go with Starfidner in my local area so looking forward to getting my hands on as much adventure material as possible for quick and easy sessions. What's the ETA on availability? All the other Starfinder stuff is available except the scenarios. For us Superscribers, when should we be getting the scenario PDFs? 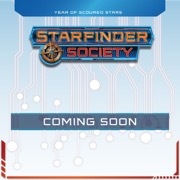 If it's like the PFS subscription, the Starfinder Society subscriber run will need to be manually commenced (as opposed to pre-setting a release date for general availability). The granting of free copies to superscribers is no doubt an added complication, given this is the first time they've done something like that. I suspect we won't see them until Katina/ Chris get in to the office. I saw somewhere that the planned day of release was the 17th August, so barring glitches, it should be today sometime. I admit, I'm new to this whole subscription thing, but how does this work, do they just show up in My Downloads, or do I have to add them to the cart and then get the discounted price? I see that people were getting these hours ago. I haven't seen them on my downloads, also my PFS scenarios haven't shown up either. I know customer service is out due to Gen Con (wish I was there, it sounds like a blast), but is there someone other than here that I can contact? I just got mine recently. There are too many people to get them to, so they aren't all granted at once. Mil, they will automatically arrive in your My Downloads. They *should* all be granted at once, but a bug prevented that from working for everyone, so there's a manual component this month. See this thread in the Customer Service forum for the status. Am I missing something? Why am I not getting credited the Society Scenarios but it says I'm subscribed under my subscriptions? They aren't pulling up in My Downloads. I subscribed to all the other ones so I was understanding this to be the complimentary option. Yes, you should have got access to the first three automatically. I'd start a thread in the CS Forum so they can look into what went wrong. Mine doesn't show I am subscribed, but I have all other subs. I did get the first 3, but I see there is a fourth that I do not have. I've noticed that too for mine. I would put post to the customer service thread. Mine did not auto generate the 4th either but they hooked me up once I reported it and I am subscribed even. You should have access to all four by now. I believe there have been some intermittent teething issues with some subscribers or SF Superscribers not being granted access. I'd suggest starting an individual thread in the customer service forum. CS might notice it here and be able to sort it, but they'll definitely notice it if you start a thread outlining your individual problem in the customer service subforum.